Having a good credit score is essential. Your credit score is no longer being used solely for credit applications. Employers now use your score as a gauge of how responsible you are with your finances. Their logic is that if you are not responsible with your own money, then they cannot assume that you will be responsible on the job. Although many people object to this way of thinking, it is very clear that having a good credit score is a necessity in today’s world. You may have recently looked at your credit score and seen that it was average or poor. If you fall into this category, then you’re not alone. Millions of people struggle with re-building their credit score. While there are many factors that go into your final score, arguably the biggest contributor is the amount of debt you have. Credit companies do not like to see a high level of debt as this suggests financial distress and a higher likelihood of eventual default. If you have a poor credit score, lowering your debt should be your primary goal. Reducing your debt is not as challenging as it may seem. As an example, if you have a credit card with $1,000 on it at a 10% interest rate and a card with $100 at a 20% interest rate, then you should prioritize to pay off the $100 card first. Your goal is to keep the interest charges that you incur to a minimum. This way, you’ll be able to progressively pay more towards principal and reduce your debt faster. Consolidating your debt often helps too. Rather than having five cards with $1,000 on them each, it may make more sense to take a $5,000 loan at a lower interest rate and pay off all the cards. Note that once you take out this loan it is imperative that you do not run up the balances on your cards again! Doing so represents a slippery slope towards financial ruin. Take the loan and reduce your spending by the monthly loan payment amount. You’ll gradually pay down your debt and not accrue any additional debt. Paying down your debt is the fastest way to boost your credit score. The way to get your debt down is to have focus and discipline. Pay down the highest APR cards first. Keep your spending under control so that you don’t make progress only to find yourself back in debt later. Generally speaking, younger consumers have lower credit scores on average. Older people typically make more money and have longer credit histories than younger. One of the most common mistakes people make is to consolidate their debt and max out their credit cards again. The goal is to always keep your card balances low. 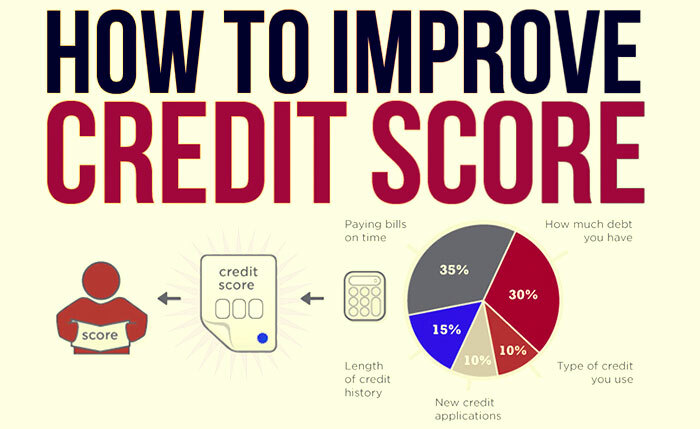 If you follow these simple steps, then you are well on your way towards increasing your credit score!